I generally read ‘literary’ or historical fiction, and I’ve wanted to reach out into more genre fiction for a while. While browsing in Waterstones a few weeks ago I wandered with my boyfriend up to the sci fi/fantasy section, and came across the Lady Trent series by Marie Brennan. Lady Trent is a ‘dragon naturalist’ and the series is made up of several volumes of her memoirs, starting with A Natural History of Dragons. 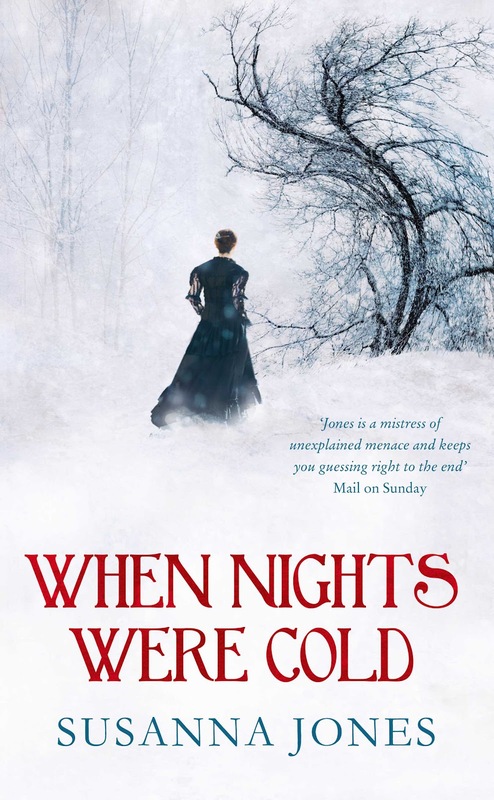 The series is set in an alternate Victorian universe where, in the first novel at least, a young Lady Trent battles against gender norms and social stereotypes. The book is essentially a Victorian adventure, with a bit of romance thrown in, plus some dragons – which it turns out works for me. In fact I enjoyed A Natural History of Dragons so much that today I went to Waterstones and bought the next book in the series, The Tropic of Serpents. Hopefully it will be just as good! I’m glad I branched out with this book, and think I may read more fantasy like this in the future. This is partly because I feel like reading something a bit different, and also because the two books I read before this were both about life during World War Two, both of which were brilliant but not exactly cheery. I’ve enjoyed the escapism of Lady Trent and look forward to more Victorian dragon romps. Published in 2014 by Titan Books. Available from Wordery and Foyles. I Need Bookshops. We All Do. Today, on the way home from looking after my little nephew, I stopped in at WHSmith. I saw the poster for their summer promotions in the window, and remembered that I had wanted to read The Age of Miracles by Karen Thompson Walker for a while, so I went in. This was the one in Pinner, north west London. It has a decent size book section at the back on the left, but like all WHSmith shops the books on offer are displayed proudly with covers out, while the rest are jammed in the bookshelves and you can’t really browse comfortably. I stood around and scanned the offer shelves for a while and suddenly thought, god it’s been ages since I was in a bookshop! 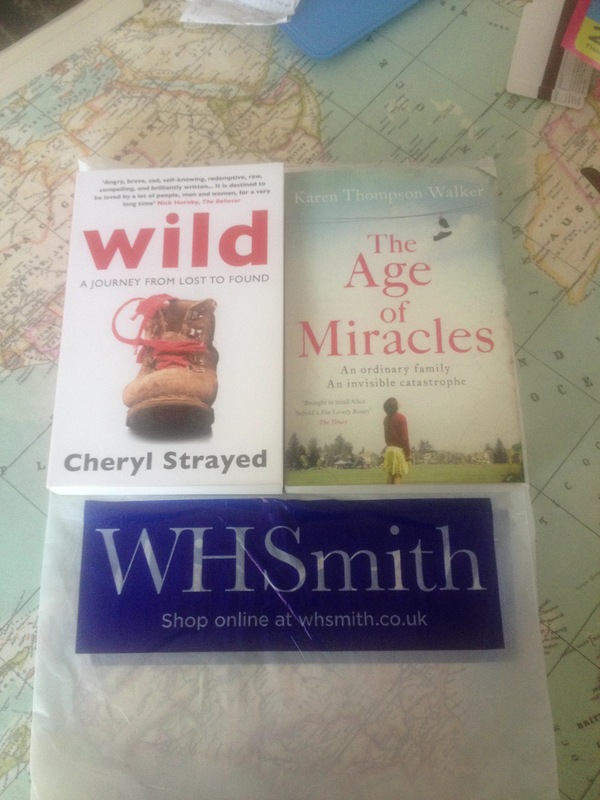 Here’s what I bought at WHSmith; they have crappy bags. We used to have a big Waterstones near me in Watford town centre and I popped in there almost every time I was in Watford, even if I didn’t buy anything (should have bought more things, clearly). It closed just before Christmas (I saw the tweet announcing this on Christmas Eve, real mood killer), and since then I have visited the big Waterstones in Piccadilly for a book event and once or twice when shopping, but that’s it. And there are literally no other bookshops near me. There’s a WHSmith in Watford, but I don’t really count that. They just have a book section. Not the same. Waterstones as a company are still doing pretty well, as far as I know, so it must just be that the population of Watford and the surrounding areas don’t read a lot. SHAME ON YOU ALL! The shop had been there since the mid-nineties, so to me that indicates a decline in reading and/or book buying in recent years. I blame eReaders and people’s laziness. 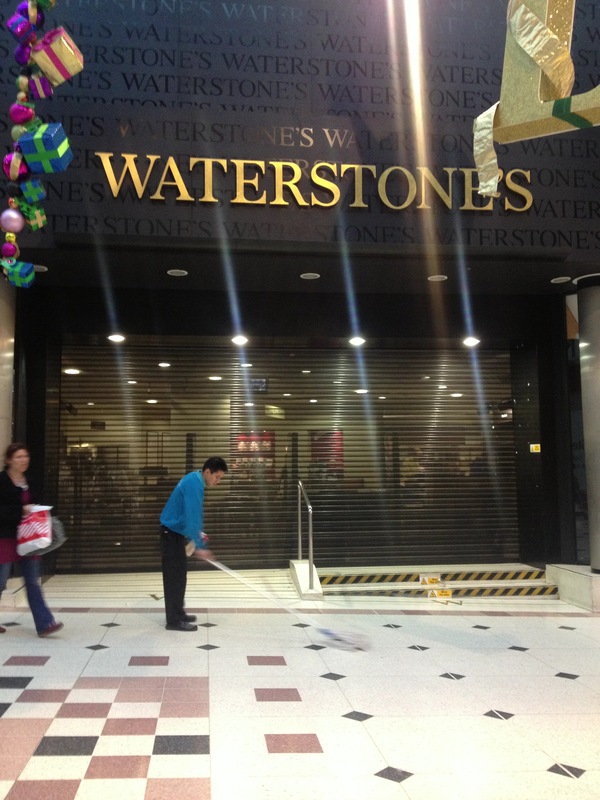 Finding out that my local Waterstones had closed was truly gutting; I was genuinely upset. It was a lovely big shop with three floors of books, one being entirely for children. They also sold really nice cards and gift-y things like Emma Bridgewater and Cath Kidston stuff, and arty stationery. The staff were always really polite and helpful, and I liked that one of them had also read the Hans Fallada biography I bought there. My fellow blogger Sarah Watkins worked there and had done since it opened, and I was gutted for her too. I nearly cried in the high street! Made sadder by Christmas decorations and lone cleaner. More than all of that I was devastated that a shop like this couldn’t survive in the nearest town to where I live. And yet the disgustingly bright sweet shop up the way stayed open, and the gift shop selling tat, and all the other shops that do nothing but encourage consumerism (which I’m not necessarily against, but there is more to life). I saw it as anti-intellectualism, something that I cannot stand and that makes me really angry. I had several existential moments of worrying whether the human race were becoming too moronic and obsessed with instant gratification to even need a bookshop anymore. It was unpleasant. While I personally have always loved reading and books in general, there is also a principal to the things. Printing and the production of books (in any form) is a cornerstone of civilisation as we know it and a vital element in the historical intellectualisation of ordinary people. Books were once, many moons ago, only available to rich people or academics, but now anyone can buy them and read them. They are accessible, cheap (mostly), and cover topics to suit every taste; they also cater to every level of reading ability, so you don’t have to be a ‘clever clogs’ to be a reader. I have no idea if Stephen Fry actually said this, but it doesn’t matter. The argument is true. While I don’t really like Kindles and eReaders and am happy to stick with books, I agree with this point. They’re a ‘threat’ but not in the sense that books will die out. They’re an alternative. Anyway. My point is that books will always sell in some way or another and not everything is better online. While Amazon are buggering up bookshop chains, people are rediscovering a love of independent bookshops and ‘unusual’ places and things. In an age of mass consumerism and advertising, I think we are all beginning to re-appreciate personal taste, shopping experiences, knowledgeable staff and proper shops. I need bookshops. We need bookshops. Support yours. 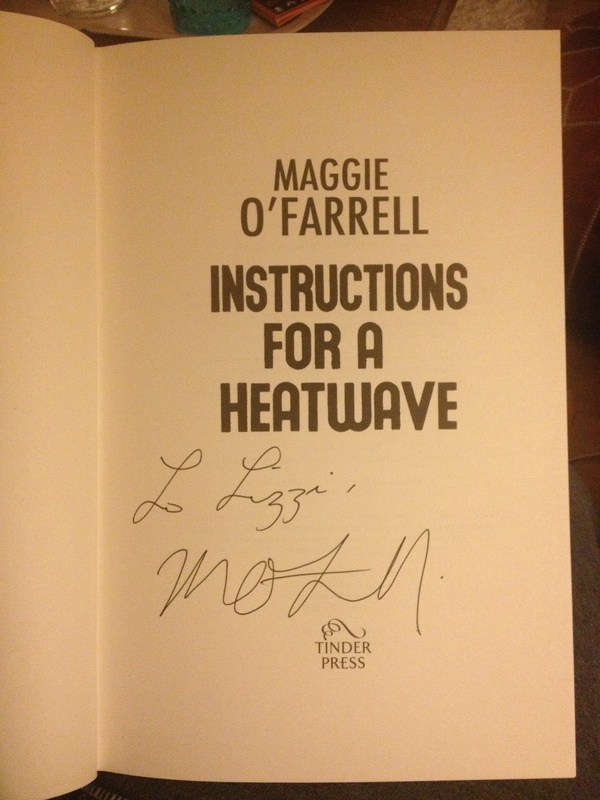 Maggie O’Farrell Fever: The Heatwave Is Here! 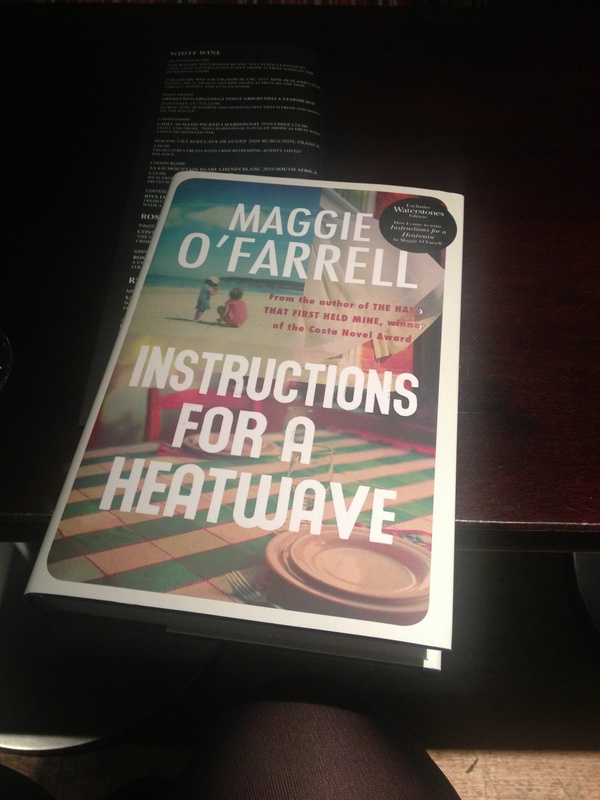 This week sees the publication of the first book from Tinder Press, which is very exciting in itself; what’s even more exciting (I know) is the fact that it is the new novel by the much-loved Maggie O’Farrell. Instructions for a Heatwave is her sixth novel and the first of hers that I have read, although the interest and enthusiasm exhibited by dedicated fans for her novel The Vanishing Act of Esme Lennox has got me reading that one now too. Personally I loved Heatwave – I reviewed it before Christmas and had to fight to stop myself gushing about how much I loved it. In 1976 a heatwave struck Britain, halting life in its tracks and making people behave strangely. Robert Riordan goes out to buy the paper one morning and does not come back. His disappearance prompts his three estranged, grown up children to come home to their mother Gretta (a wonderfully drawn character that Maggie describes as ‘tragi-comic’), and their complicated and emotional relationships are reexamined in the light of their father’s mysterious disappearance. The three children, Michael Francis, Monica and Aoife are each given their own chapters and are depicted with enough depth of feeling as to almost make the reader feel as if they are real people. To celebrate the publication of Instructions for a Heatwave, the amazing team at Tinder Press organised a host of events. On Tuesday 26th, excited fans (including me of course!) 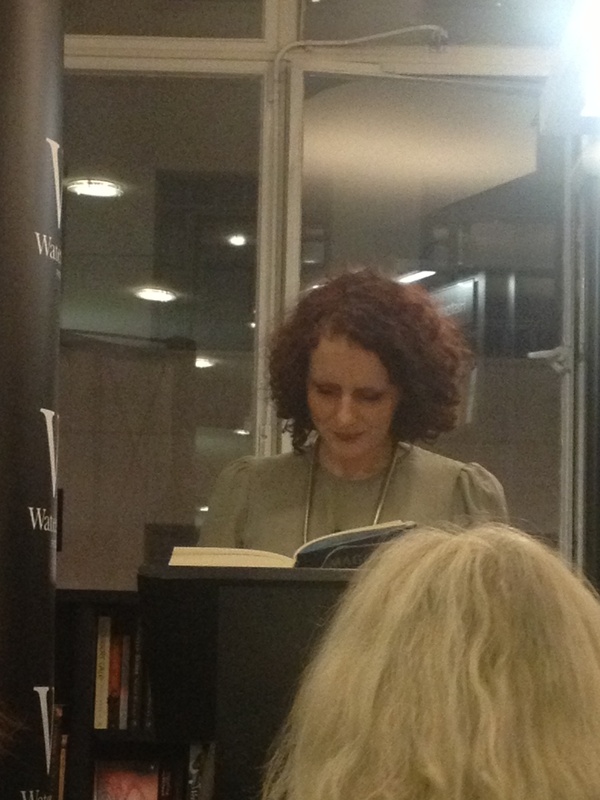 gathered at Waterstones Piccadilly to hear Maggie in conversation with The Observer’s Elizabeth Day, herself an admittedly huge fan of Maggie’s work. I already had a proof of the novel but I bought myself a lovely big hardback for Maggie to sign; it is a beautiful book, inside and out. Maggie read beautifully from the book, and then sat down to a Q&A session with Elizabeth Day, taking questions from the audience as well. I’m always saying how interesting it is to hear an author talk about a book that you loved, and this occasion was no exception. To hear an author read their own work aloud is also fantastic, as you hear how it is ‘meant’ to sound, how it was first conceived of. 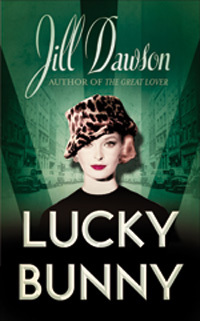 Maggie has a lovely speaking voice and she read clearly and with great character, entertaining the audience and bringing this fantastic book and its characters to life. Elizabeth Day was a wonderful host and, having met Maggie before, created a lovely relaxed atmosphere in which discussion came easily. The audience was enraptured. When asked about feminism and gender issues, both in the novel and in real life, Maggie spoke of how feminism is ‘common sense’ to her and that she kept the radical feminist movement of the 1970s in mind when she wrote the character of Claire, Michael Francis’ wife, in the sense that Claire may have heard about these issues and was probably thinking about them when dealing with her troubled marriage and trying to create a place for herself in the world. 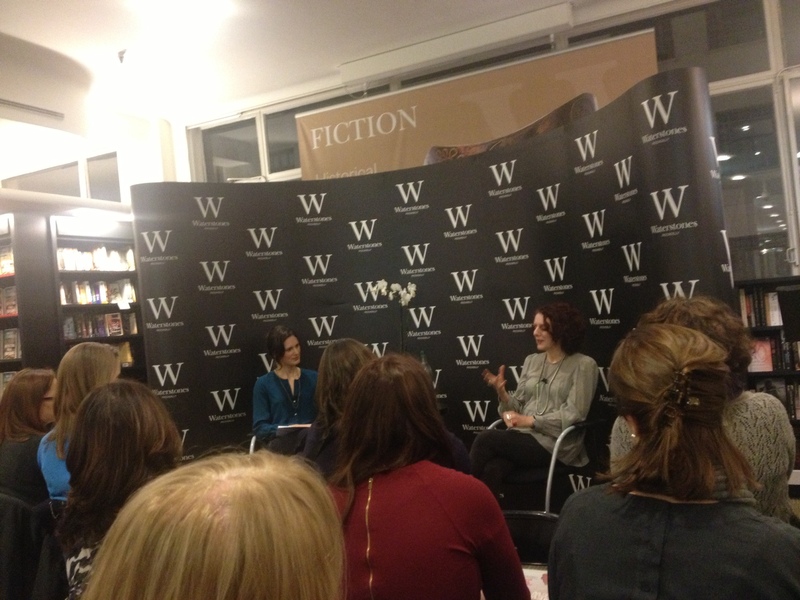 I was rather pleased by Maggie’s answer when Elizabeth Day asked her what she thought about being pigeonholed as a writer of ‘women’s fiction’ that was only about domestic life; Maggie argued that all life is really about family, as they are a crucial influence on us throughout our lives. In her research for Heatwave she read many books about families, and even found herself reading Hamlet – as she pointed out, that too is a story about a family. Then came the inevitable discussion about the character of Aoife, the youngest sibling. She lives far away from the rest of her family in New York, and her life is something of a mystery to them. Her biggest secret is that she is not able to read, something she keeps from every single person in her life. To the reader it soon becomes clear that Aoife has dyslexia, as she describes how letters seem to move and change in front of her eyes. But of course Aoife lives in a world that does not yet recognise her condition, and she feels there must be something wrong with her. Her predicament creates, Maggie said, an interesting relationship between Aoife and the reader, as we know she is dyslexic but she does not. The reader is also the only one to share Aoife’s secret and this creates a deep sense of sympathy with her. To me she was the most real, the most engaging, the most likeable. When asked why she chose to give Aoife dyslexia, Maggie’s answer was twofold: her son was diagnosed with dyslexia while she was writing the novel; and also that because Aoife is the youngest she felt that she needed some kind of curse or burden, like the youngest children often do in fairytales. This added, for me, an extra spark to Aoife’s character, and further marked her out as special in some way. 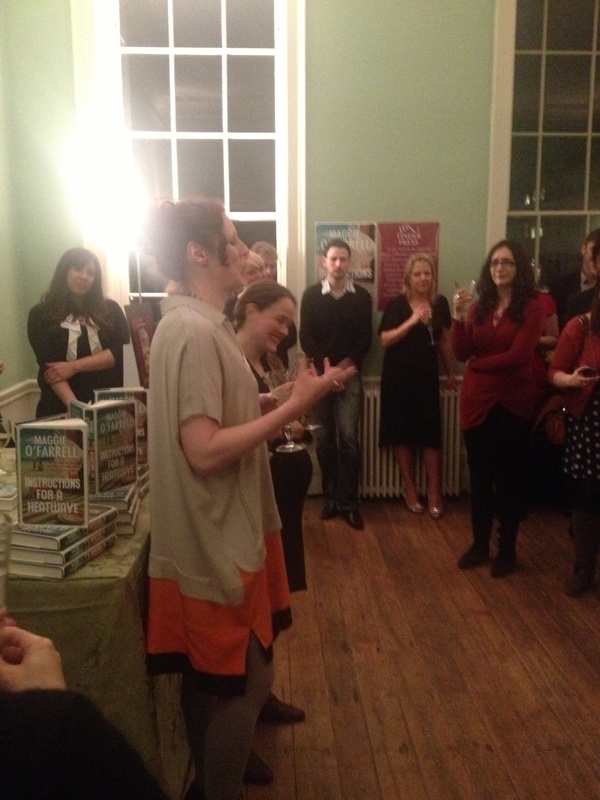 The next night it was the official launch party for Instructions for a Heatwave. After a long day at work I was ready to collapse on the sofa, but made my way over to a townhouse on Fitzroy Square for what turned out to be a really great evening. In two high-ceilinged green rooms, publishing bods, as well as authors, journalists, bloggers, and members of Maggie’s family (including her three adorable children) milled around and chatted, drinking champagne and white wine and eating yummy little canapes that were presented on a variety of impractically shaped platters (one was like a giant ruler, another was like a flight of stairs…). Having met Headline publicist extraordinaire Georgina Moore at the Waterstones event, I went over and said hello, and was introduced to two fellow bloggers, both called Amanda, from book blog One More Page and fashion and lifestyle blog The Women’s Room. It is always great to meet fellow bloggers and hear their perspectives on the book in question. The Women’s Room is more of a fashion blog but Amanda was really enthusiastic about Heatwave and very eager to hear more about book blogging, and I was happy to pass on my knowledge. 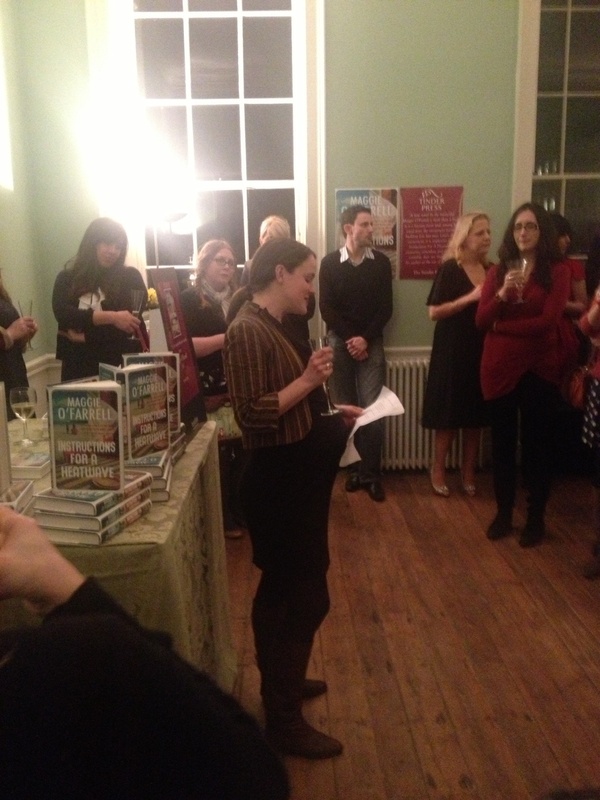 Mary-Anne Harrington from Tinder Press made a great little speech about Maggie and her work, and congratulated both the author and the publishing team for all their hard work. Maggie was then persuaded to come up and say a few words, and she was very gracious in accepting praise and very grateful that we had all turned out for the event. Then it was time for a splash more wine, and lots more mingling. I was lucky enough to chat to the lady of the hour, as well as Georgina and Sam Eades from Tinder Press, and Emily from editorial at Headline. Everyone was so welcoming and happy to be there, and the party had a great feel to it and plenty of chatter that I’m sure could be heard outside. Well done Tinder for organising such a great event! I loved reading Instructions for a Heatwave, and I have thoroughly enjoyed the press events this week. Meeting Maggie and the amazing team at Tinder Press has been a joy, and has added an extra layer of appreciation for the work they do. I cannot wait for the Tinder Press launch party, to which most of the authors will be coming (amazing!! ), and for the individual events to promote each title. Congratulations to Tinder and Maggie O’Farrell for a job well done. 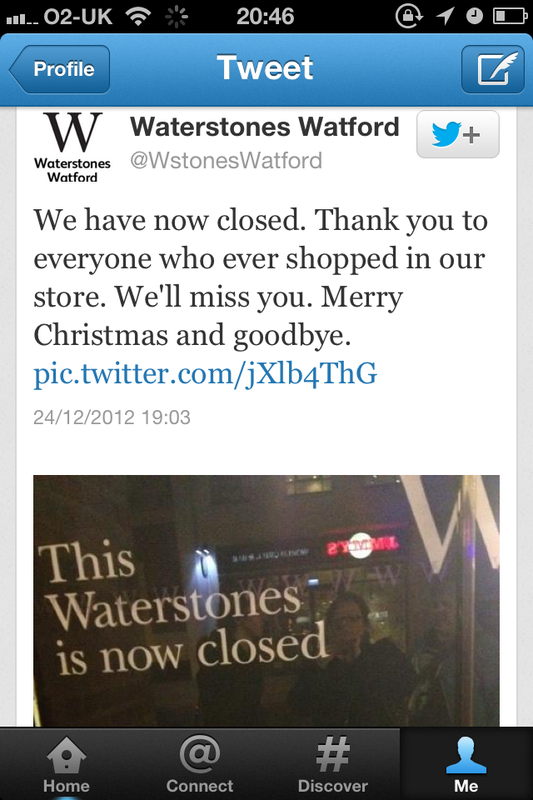 I have just learned via a retweet on Twitter that my local Waterstones in Watford, Hertfordshire has closed. It had been there for so long I don’t remember it opening, and I visited it for years. Three floors – yes, THREE – of books. A lower ground floor for children’s, fiction on the ground floor, and cookery, history etc upstairs. The staff were always knowledgeable and helpful, as well as friendly. It was a big enough store to wonder around for a while, with lots of different genre sections and comfy seats. Fiction was huge, as was history and sci fi & fantasy. They also sold Moleskines and lovely cards. There used to be a big Borders store in Watford as well. I worked there for a few months in 2007, and while it wasn’t the most thrilling job I loved being around books and readers all day. It closed in 2009 or 2010 and has been empty ever since. It’s a big store (with a mezzanine floor that used to house a Starbucks and the staff room) and now it is a big, miserable reminder of the recession and the vulnerability of book shops. 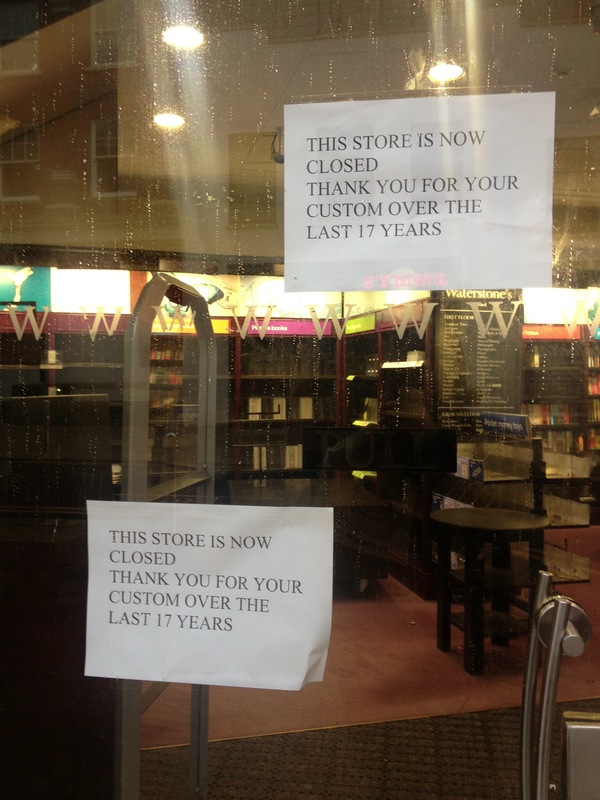 Now my beloved Waterstones store will play the same role. A big store, once full of books, now dark and empty. I’m all for independent book shops, but in a town like Watford only chains would have a chance. Now we only have W. H. Smith’s, and I have never bought a book there. It’s all Katie Price, Richard & Judy and 50 Shades of Grey. Ugh. I weep for humanity. And I will not be able to walk past my empty Waterstones without turning away. Fiction Uncovered is a promotion which celebrates our best British fiction writers. The promotion is supported by Arts Council England and funded by the National Lottery. 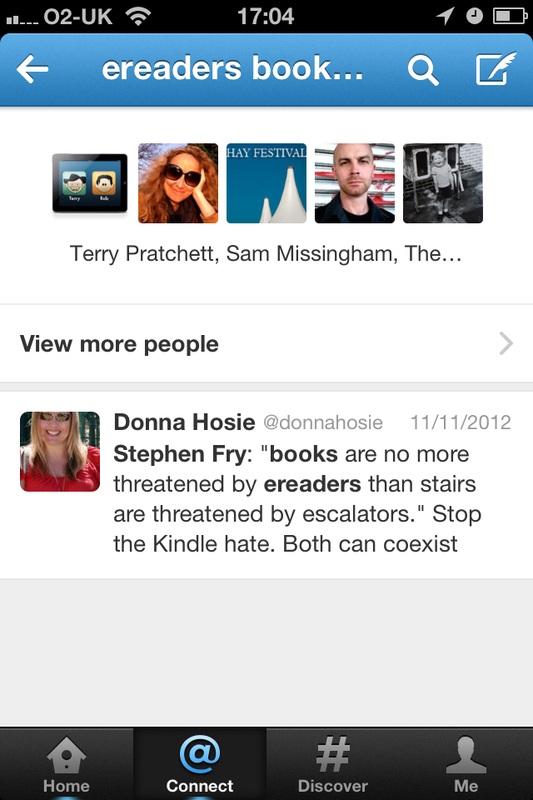 In 2012, retailers including Waterstone’s, Foyles, iBookstore, Amazon and The Book Depository will support the promotion. We also work in partnership with The Reading Agency to reach libraries and reading groups, and with Lovereading UK to reach dedicated readers. You can see a full list of the Fiction Uncovered partners here. Now in its second year, the 2012 list of eight British authors has some truly great stuff on it, one of which is This is Life by Dan Rhodes, which was reviewed on the blog earlier this year. See the review here. Personally, I love promotions like this. Fiction Uncovered do not present an award, and they are not telling you that YOU MUST READ THIS OR EVERYONE WILL THINK YOU’RE UNCOOL, they are simply helping to promote some genuinely good British writing. It is also fantastic that they work with the Arts Council England, a credible and highly respected organisation that reminds us that writing is an art form and should be paid attention to, and, frankly, yes, revered. Richard & Judy’s Book Club, this ain’t. I am also thoroughly pleased by the retailers’ involvement. Physical book sales are suffering, and shops like Foyles and Waterstones may be big brands but they are championing the printed word in a sea of ebooks. Yes, they promote ebooks too (see Waterstone’s recent Kindle deal with Amazon) but they have not simply given up and conceded defeat to the digitalisation of information. I personally do not own an ereader, and though I do not object to them per se, I think it is vitally important to maintain the industry of printed books. Obviously. Printing is only a cornerstone of modern civilisation for goodness’ sake. The variety of the list is important. It means that different types of readers are included, but it’s lack of in-your-face promotion means that the recommendations are not patronising, nor do they claim to be the be-all-and-end-all of good fiction in 2012. There are probably loads of other good fiction books out this year, this is just a selection. Which books on the list appeal to you? Find out more about them here and let me know!